For all the interest that wireless sensor networks have created over the past decade, there are few examples to show that they are truly delivering on this promise and anticipation. What is missing? Deviating from the usual focus on routing and energy efficiency, Building Sensor Networks: From Design to Applications attempts to stitch together the path from conceptual development of applications, on one end, to actual complete applications at the other. 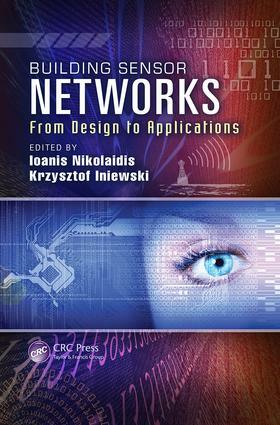 With this change in perspective, the book examines important facets of wireless sensor networks (WSNs) that are not often discussed in the literature. Organized into three sections, the book presents insights from international experts representing both industry and academia. The first section, on design practices, explores alternative ways to approach the tasks of developing a suitable WSN solution to an application and assisting that development in a manner that is not necessarily tied to a particular application. The second section, on networking protocols, illustrates the impact of the intermediaries—the "glue" of putting applications together. Chapters look at ways to address traffic, delays in network clustering, and the coexistence of a WSN with other systems on a frequency band. The final section of the book delves into experiences with applications in chemical sensing, defense, global trade and security, and ecosystem monitoring. Although these applications may fail the purist definition of an ideal WSN, they offer valuable lessons for the future development and deployment of WSNs. Emphasizing the need to build applications, the contributors present examples of what applications of WSNs could look like and identify the constraints. Throughout, the book challenges and illuminates your thinking about how to tame the complexity of designing a WSN application. It is essential reading for anyone interested in future wireless technologies.